So hopefully you had a little look at my previous post ‘Soap within Soaps‘ and enjoyed it. Well this blog is about using textures inside soaps rather than other moulded soaps. I love using tea tree essential oils in soaps for your face as it really wakes me up. Why not couple that with an interesting look like swirls! I have recently found the wonders of Bramble Berry Soap Making Supplies and wow they have some amazing products. I wish I could win the lottery and buy it all, SO MUCH FUN!!! Melt the opaque soap base in the microwave or using the simple bain-marie. Remember, if you are using the microwave only heat in 10-15 seconds bursts. The soap may over cook and burn. Add some of the tea tree essential oil and blue dye. Mix thoroughly. Pour the opaque mixture into a container and let it set for 12 hours. you want it malleable so that it curls. Once set, use the potato peeler to make curls. 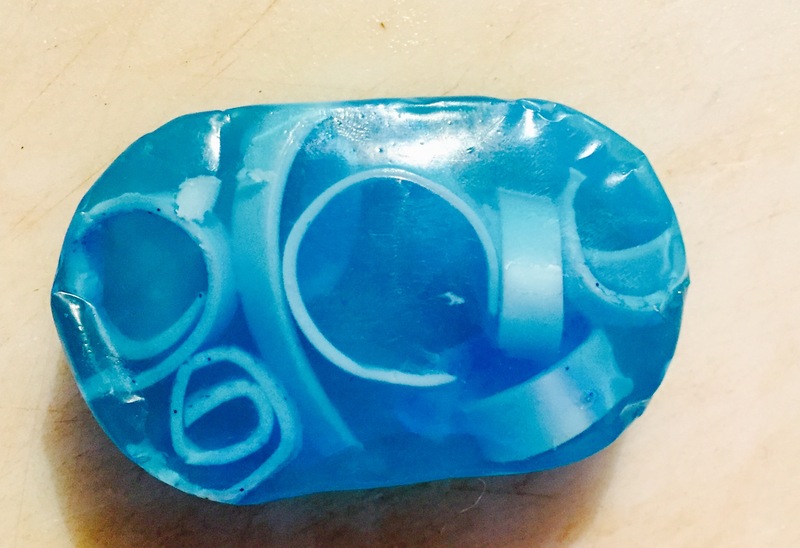 Melt the clear soap base just like before. Add your colour and fragrance (only a few drops of colour as you want your soap to stay as clear as possible). Place your opaque soap curls in your final mould and pour the clear soap base mixture over. Spray the top with the rubbing alcohol spray to disperse any bubbles. The final result is a refreshing soap that invigorates you in the morning. I had some left over opaque soap so I made a hippo! Say hello to Henry the Hippo!